World Youth Alliance Africa in partnership with Vision Changers Kenya and Youth Alliance for Leadership and Development in Africa(YALDA), University of Nairobi will host the second WYA Africa Youth Summit. This summit will bring together university students, young people, World Youth Alliance Africa members and youth leaders to listen and interact with entrepreneurs and leaders in order to be empowered on matters entrepreneurship and leadership. 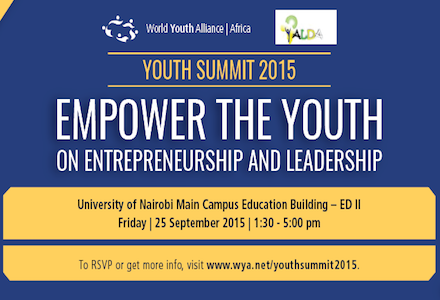 Complete and submit the WYA Summit Application form. For more information, visit World Youth Alliance Foundation. ← Networking Hack: Don’t Forget Anyone’s Name Ever Again!